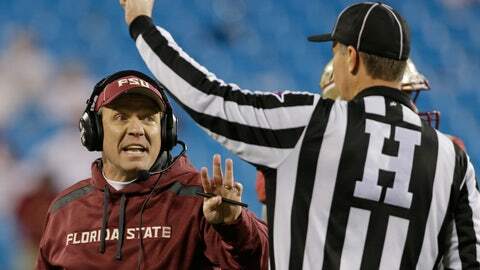 Florida State head coach Jimbo Fisher argues a call in the first half of the Atlantic Coast Conference Championship. TALLAHASSEE, Fla. — Florida State returned to the practice field on Wednesday after a 10-day break as the No. 1 Seminoles prepare to face No. 2 Auburn in the BCS championship game Jan. 6. Fisher, however, has been connected to the opening at Texas, where Mack Brown decided he will step down after the Longhorns’ bowl game. But Fisher said he would not address stories by media outlets that reported he is a candidate to replace Brown. Fisher has reportedly agreed to a $4.1 million extension that would begin in 2014, raising his salary from the $2.75 million he made this season. The contract has not been finalized. His current contract is loaded with incentives, and Fisher has already earned $50,000 for winning the ACC Atlantic, $50,000 for claiming the ACC title and $125,000 for playing in a national championship game. A top-5 finish, which is essentially guaranteed, is worth another $100,000. But a BCS title plus an unbeaten season would yield a total of $200,000. Fisher is focusing on Florida State’s practices before the Christmas break. The Seminoles will focus on fundamentals over the next five days in what Fisher compares to August practices. The team will take a break for the holidays Dec. 23-25, then practice in Tallahassee for five days before flying to California on New Year’s Eve. Fisher said that he does not expect Florida State to have players academically ineligible for the BCS title game. “The way it looks now, we should be 100 percent,” Fisher said. Florida State’s draft-eligible underclassmen have submitted their names to the NFL draft advisory council to receive an evaluation of where they might be picked if they choose to leave school early. Fisher said he has talked with every junior or redshirt sophomore who submitted his paperwork to be evaluated. “You have to make good decisions based on the information that you have at the present time and what your true value is to the next level,” Fisher said. “You want maximum value out of yourself — when you go and how you go. They’re not buying you on sale or (if) you’re as high as you need to go, you need to go.